As you guys know, I’m from New Jersey and spend a large part of my life at the beach. My family is fortunate enough to have two homes, so when we heard about evacuations along the Jersey coastline, we packed up that house and headed 30 miles inland to wait out the storm…having no idea that our town would be changed forever. We woke up on Tuesday to no electricity and a ravaged yard, but nothing that wasn’t manageable. Not having anything else to do, my parents and I jumped in the car and sped back to the beach to see how that house held up. We weren’t prepared for a town that looked like a war zone. Since a lot of trees were uprooted, we ducked down a side street and were stopped by massive flood. Our hearts sank and conversation in the car stalled as we were forced to park blocks away from our house due to debris. Exiting the car, my mom and I saw remnants of a playground slide sitting on the side of the road…I think that’s when it started to dawn on us that we were about to see some serious damage. We walked a little further and got to Ocean Avenue, which was covered by sand, water, and rubble. You couldn’t even tell it used to be a road. Cold wind whipped around us, but everything seemed eerily still. My mom’s favorite store on the boardwalk was ripped in half. Inside, pipes sprayed water in every direction. Instead of a wall, we could see straight through to the ocean. The only thing identifying it as a store was a shattered mannequin laying lifelessly on a mound of tattered clothing. We continued walking in silence as questions raced through my mind – Where was the boardwalk? Seriously….where was it? How could the water have been strong enough to rip a building in half and uproot the boardwalk like it was nothing? We live in NJ, stuff like this doesn’t happen to us! Everywhere I looked, I saw devastation. For my entire life, 25 years, things like the boardwalk have been there and I never once thought they would disappear. 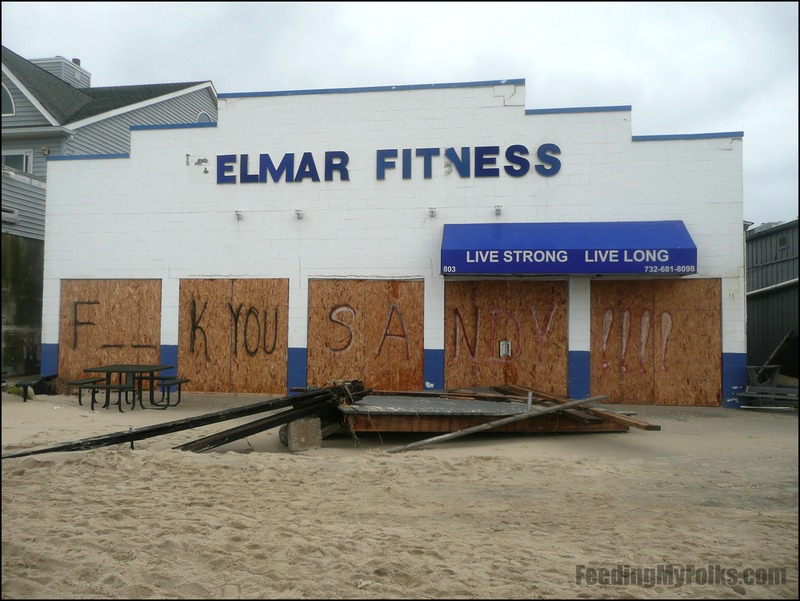 Due to Sandy, they’re now only memories. Our wandering came to a halt as we approached our unrecognizable street covered in piles of boardwalk, boulders, and floodwater. It seemed more like a lake than a road. To get to the front door, we had to jump from wood onto balled up sod onto rocks just to make it to the steps. Our house was spared other than damage from a chunk of the boardwalk that slammed into our porch. Of course there’s flooding in the basement, but our place is standing and I was even able to break in (door was damaged and unable to open) to use the bathroom! A dry interior with working pipes was such a relief. We arrived in town fairly early in the morning, and as more and more people began filtering back to their homes, the more real everything became. People walked the streets muttering “holy s***” to themselves or sat on broken porches, crying as they surveyed the damage. It was utterly heartbreaking and something that has haunted my dreams every night this week. We locked our house back up and walked a bit further down Ocean Avenue to watch the governor of New Jersey, Chris Christie, land his helicopter to address the crowd. When we met him, he hugged my mom and promised her that he will work hard to get everyone’s lives back to normal. Say what you will about him, but it was comforting to see someone of his importance “down in the trenches” so soon after a disaster. I appreciate him caring and taking care of our state. Throughout the day, friends in surrounding towns sent me picture messages of damage in their areas. Some of the most jarring were images of Seaside and Wild Wood, where mangled roller coasters jutted out of the sea. Since then I’ve heard stories about my favorite stomping grounds from Asbury Park to Point Pleasant that are completely wiped out. 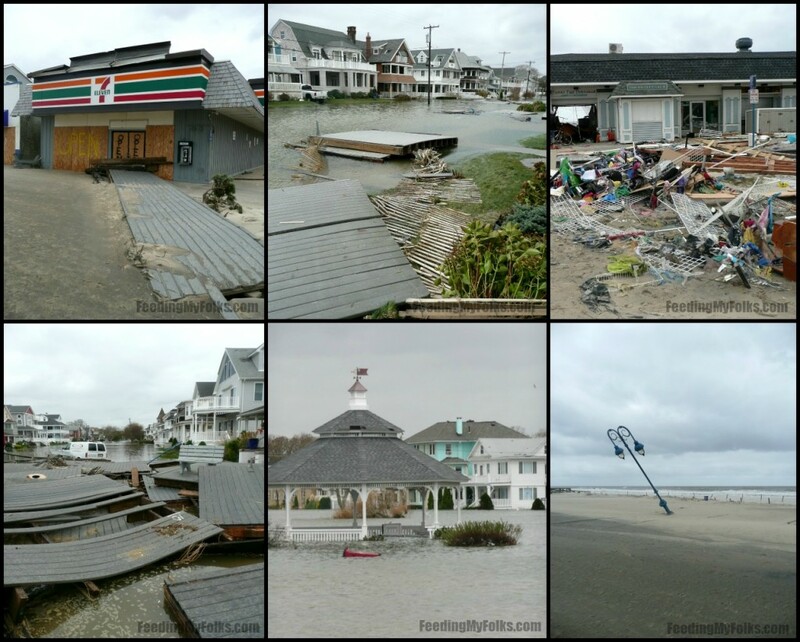 Luckily most houses in my town fared better than other beach communities, but we’re all going through such a difficult time right now. If you can, please donate money to the Red Cross to help with recovery – people desperately NEED food, water, and supplies distributed throughout NJ, NY, CT, and the surrounding areas. Millions are without power, freezing, hungry, and homeless for the foreseeable future. Life at the Jersey Shore is going to be different for a while as we recover and rebuild. But we will rebuild. If there is anything you need to know about NJ, it’s that we won’t go down without a fight. To donate to the Red Cross for disaster relief, please click here. Gotta stay strong for everyone in your community. Be the change! Thanks, Hannah! Worked hard all weekend to clean up debris/rubble…it’s a long way to go but every day it gets a little bit better.